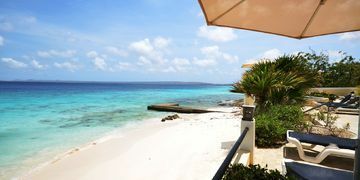 Bellevue Residence is a 12 unit luxury beachfront residence, located in the quiet area of Belnem. Belnem is central to many of the best dive and snorkel sites and is a short drive to the kite-boarding beach and the windsurfing bay. Because Bellevue is located on the leeward side of the island, the water is almost always calm on your private beach. Stroll across the soft sand straight into the sparkling, warm, clear, water for a swim or a snorkel. Imagine grabbing your dive gear from the poolside dive locker and taking a short swim out to one of the finest reefs in the Caribbean. Take the stairs or the elevator to the second floor to find Bellevue 4 on the North corner. The spacious living room, has an open design with the fully equipped kitchen with everything you will need to cook your meals at home including an oven, a refrigerator/freezer , microwave, dishwasher and a blender to prepare tropical cocktails! 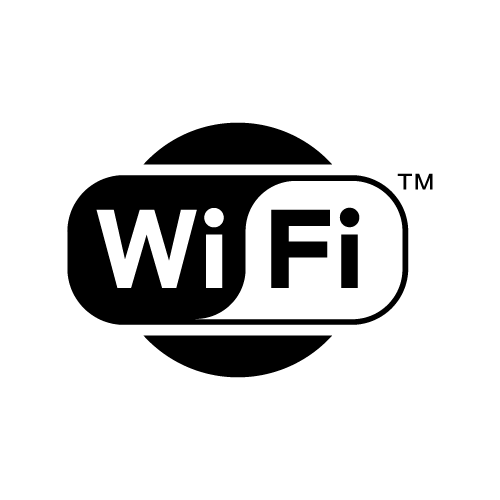 To make your stay as comfortable as possible, the entire condo is fully air-conditioned, has fast speed and free-of-charge WIFI and ceiling fans. Relax in the living room by watching your favorite program on the flat screen television or read one of the many books you will find here. All doors and windows throughout the house have screens to allow you to enjoy the breezes. There are 2 bedrooms each with en suite bathrooms. Both bedrooms have queen size beds which were custom made to allow for twin size beds to slide underneath, for special situations such as children sleeping the room with their parents. The master bathroom features a double sink, a bathtub with double shower and a toilet and the second bathroom features a sink, shower and toilet. The second bedroom also has entrance from the hallway, to use it as a guest’s bathroom. On the premises you will find a shared swimming pool, rinse tank and dive locker. And of course the sandy beach! 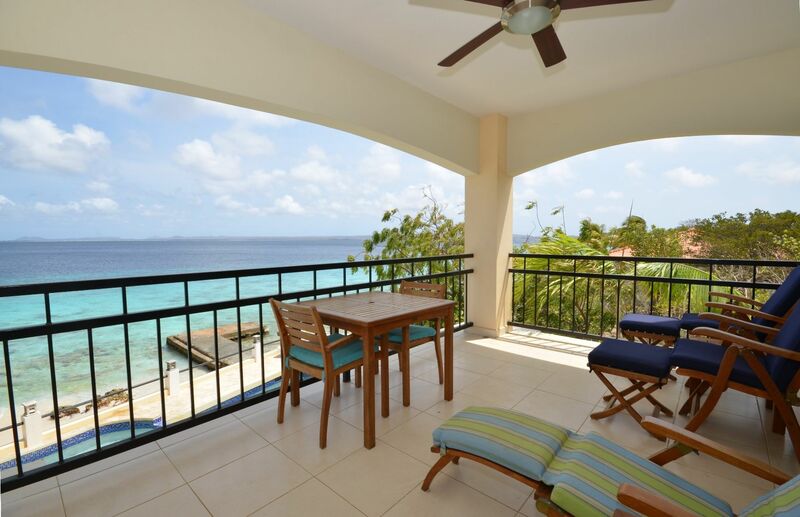 "This Bellevue apartment is very well maintained, nicely equipped, very clean with a spectacular ocean view. 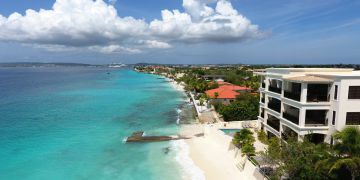 The beds are high quality, very comfortable — approaching a Westin Hotel Heavenly bed experience— not the typical hard Bonaire bed. Having a washing machine is a wonderful feature too. The solid teak furniture is perfectly suited for the apartment — we could not have asked for a better equipped or more comfortable place to stay. Throw in wifi, a lovely little sandy beach, very nice house reef and rinse tank/dive gear storage — hard to beat anywhere on the island. We had a wonderful stay and were more than satisfied with this lovely apartment. You can tell that the owners love the place." I have been a client of Sunbelt for many years and have always enjoyed our stays in the properties they manage. Thank you! Sunbelt: thank you Christine! We look forward to welcome you back soon! Cleanest place on Bonaire not to mention it has the healthiest house reef, convenient to everything, and the view cannot be beat! Already booked for next year! SUNBELT: Thank you for sharing your experience with us Sherry; good to hear you had a great vacation! We look forward to welcome you back next year!